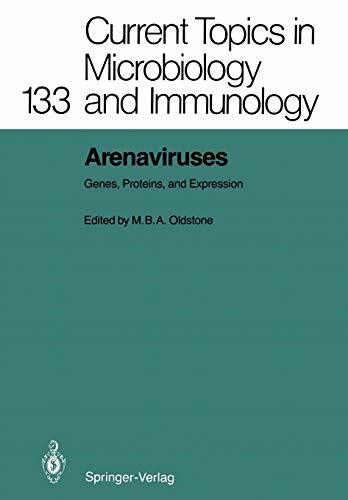 [PDF] Arenaviruses: Genes, Proteins, and Expression (Current Topics in Microbiology and Immunology) | Free eBooks Download - EBOOKEE! Description: M. B. A. OLDSTONE Viruses are generally studied either because they cause significant human, animal or plant disease or for their utility as materials to probe a basic phenomenon in biology, chemistry, genetics or molecular biology. Arenaviruses are unusually interesting in that they occupy both of these categories. Arenaviruses cause severe human diseases known primarily as the hemor rhagic fevers occurring in South and Latin America (Bolivia: Machupo virus and Argentina: Junin virus) and in Africa (Lassa virus). Because such viruses produce profound disability and may kill the persons they infect, they are a source of economic hardship in the countries where they are prevalent. Further, they provide new problems for health care personnel owing to the narrowing of the world as visitors from many countries increasingly travel to and from these endemic areas. In addition, lymphocytic choriomeningitis virus (LCMV) can infect humans worldwide, although the illness is most often less disabling than those elicited by other arenaviruses. Yet LCMV is likely of greater concern to non-arena-virologists and experimentalists using tissue culture or animals, i. e. , workers in molecular biology, cancer research, virology, immunobiology, etc. , because normal appearing cultured cells or tissues and animals used for research may be persistently infected with LCMV without manifesting clinical disease or cytopathology and transmit that infection to laboratory workers (reviewed OWSTONE and PETERS 1978). For example, HINMAN et al. No comments for "[PDF] Arenaviruses: Genes, Proteins, and Expression (Current Topics in Microbiology and Immunology)".